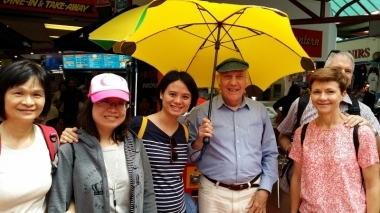 YELLA UMBRELLA WALKING TOURS, Adelaide, South Australia. Information, Photos and Reviews. No convicts here! Take a step beyond sightseeing and discover the unique history behind Adelaide and colonial South Australia. Join professional guide Bob Brady for a comprehensive exploration of this planned, utopian society. Walk in the footsteps of those early pioneers and hear the stories behind the triumphs and tragedies of those first settlers. 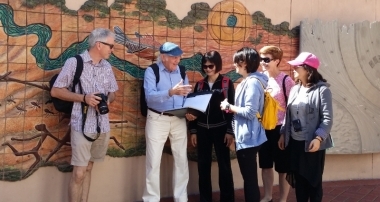 Along the way you will be introduced to the city's cultural precinct with its galleries and museums; take coffee in the majestic Adelaide Arcade; and mix with the locals at Adelaide’s famous Central Market. Tour departs from the historic Strathmore Hotel on North Terrace (op. Adelaide Railway Station) at 10am and finishes at Adelaide's Central Market at 12.30pm. Cost is A$25 per person, Children A$5. Payment by cash on the day. Pre-booking essential. A great way to start your visit to this beautiful city. Nobody has reviewed YELLA UMBRELLA WALKING TOURS yet, Be the first. You are submitting a booking enquiry. YELLA UMBRELLA WALKING TOURS will then contact you by email with details of availability and prices.